NOTE: The following story is from Rendezvous with Destiny - A History of the 101st Airborne Division, by Leonard Rapport and Arthur Northwood, Jr. (Washington, Infantry Journal Press, 1948). As I researched this story I began to assume it was apocryphal, as some of the details did not ring true after visiting the reported site of these actions. However, I was able to match up one of the 1945 photos to its current location, proving (to me) the veracity of this story. "Three paratroopers and a fire engine figured in another surrender. The paratroopers, S/Sgt. William H. Bowen, Jr. and Pvts. Harry A. Barker and McFarlan Barnson, late in the afternoon of May 6  found a big oil-burning fire engine, 'with all the gadgets ever invented for fighting fires.' ... 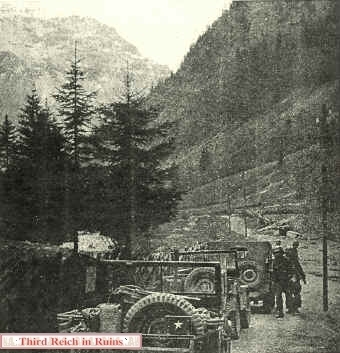 Starting out - they were several miles southwest of Berchtesgaden - they drove down the highway hunting diesel oil. Finally, seventeen miles from Berchtesgaden and just over the Austrian border near the settlement of Hirschbichl they came to a blown bridge. Sergeant Bowen started on foot across the foundations; in the dark he felt something poke him in the ribs and heard a German command to put his hands up. In a moment all three paratroopers were facing the burp gun and trying, unsuccessfully, to convince its holder that the war was over. 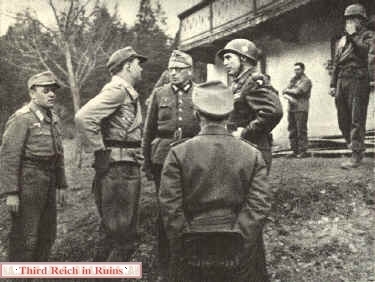 "The style in which the Germans expected to surrender was made clear when Tolsdorf and his staff came down in thirty-one vehicles, loaded with personal baggage, liquor, cigars and cigarettes. There were also plenty of accompanying girl friends. One officer even tried to trade his own pistol for an American .45. That day began what must have been a series of disillusioning days for these troops." As I tried to find the location of these events, I naturally traveled to Hirschbichl, and then I began to question this account. Hirschbichl straddles the border in the mountains west of Berchtesgaden. Today, normal automobile traffic cannot drive there from either the German side (part of the Berchtesgaden National Park) or the Austrian side - the road is closed to normal traffic - but one can ride the Post bus up the hill from either side and visit the charming village of Hirschbichl. All well and good ... except the hilly road on either side of the border has a 24% grade - one of the steepest found anywhere in the Bavarian Alps. I just could not picture the 101st Airborne paratroopers driving a diesel fire engine up these steep inclines and back down. 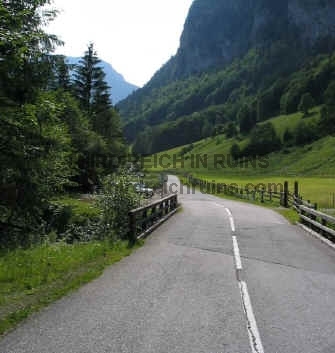 In addition, I could find no bridge that fit this description, or the photo below, near Hirschbichl. However, while traveling back to Berchtesgaden on the Austrian side, suddenly the exact vista of the mountains as seen in the period photo came into view, and it was right at a small bridge. "At this wrecked bridge Staff Sgt. William H. Bowen, Jr., and Pvts. Harry A. Barker and McFarlan Barnson were captured the night of 6 May. The jeeps belong to the 101st party which came up on 7 May to arrange surrender terms with General Tolsdorf." The modern photo is at a slightly wider angle, but a careful comparison of the mountain skylines and hillsides at the same scale, along with the curvature of the road, shows this to be the same location.